This is easily my favourite thread on GWJ right now. Keep 'em coming folks! Me too. I tried once to get into FM but it never took for me, I do love the idea of the game though. How to make yourself a hero. Yep, that'd do it! Make the save, then score the goal. That's a good day for sure. Laundry Line looks to be better at penalties than my entire Canada team was in my World Cup run in FM07 game back in the day. I had a bunch of players who were good at free kicks but their penalty stats were all single digits. The penalty competition opened with Bespoke Amphibian conjuring up the first penalty miss of his career, which was annoying. Then starting Forward Bit Nippy missed our second. Allegedly our two best penalty takers. I had lost a player to injury in the 115th minute and one of my defenders is awful at penalties, so I put Laundry Line 9th on the list. When he made a couple saves to keep us in the shoot out I said "this is set for Laundry to take the winning spot kick." I'd rather games didn't come to that however. Making me want to play again, although havn't gone deep into a FM game for years, also bounce off the newer ones for some reason. ..............Alright, yes, yes I did. I was going to take the time off anyway. This is the first time I've stuck on the game in my last few attempts. I played some longer careers with a couple of the earlier versions about ten years ago. But in my latest tries with newer versions I got pretty overwhelmed. There is a lot of new stuff in these newer versions and it can be intimidating. I think what's helped a lot with having my current career "stick" for me is that I stopped treating it like a multi-year management sim and instead focused on the season I was playing. I also didn't worry about the stuff I didn't understand yet, figuring that eventually I'd get around to it. Shockingly, we keep winning. In a light September schedule, we squeak out two wins, play to a 0-0 draw on the road, then in our last match of the month fan-favorite Kasheem Walton scores in the 82nd minute to give us a 1-0 win. Over nine league games, we have 5 wins and 4 draws. The 19 points has us in first place by a +5 goal differential. I have no idea how this is happening. Our board set our team goal to "avoid relegation". Every press story starts with "Relegation candidates AFC Telford...". The season starting odds for us to win the league were 1000-1. Our scouts still tell us that a majority of our players are "good players for the league below us". Yet somehow, with a fifth of the season played, we sit in first place, undefeated. I do know that one big area of improvement has been our keeper play. During the first three seasons I spent most of my defensive focus on improving our defenders, while leaving our keepers largely in place. I thought they were doing okay, honestly. But when I looked more deeply at their stats at the end of last year, things weren't as rosy as I thought. I sold both of those keepers on and replaced them with new keepers. One of these new keepers got hurt before the season started, but the other, Ben Killip, has locked the job down with solid, improved play. As a result, our goals allowed is currently second in the league. In other news, I'm really excited with how things turned out for us as the transfer window closed. To make a long story short, in July I totally failed at signing the three loaned players who were on our roster last season who I wanted back, and I had all but given up on them. But then one reduced his free agent salary demands to a level we could afford, so we added the defender on our roster. And then, in a flurry of transfer deadline dealings, we were able to buy the winger and midfielder back onto our roster at very affordable cost. James Murphy, the midfielder, was arguably our best player last year, so we're thrilled to get him into our club for real instead of just as a loan. The three players should all be first team players, and are improvements at their positions, so it's great to get them on board. The difficulty this creates, however, is that our roster is now a bloated 26 players, and already playing time grumblings are rising. I've managed to hold the wolves off so far, but I clearly can't carry this many players and keep everyone happy. We'll need to loan or sell a couple at least. But that issue aside, the first two months of our fourth season have us dancing wildly to the beat. I fully expect the clock to strike midnight at any minute, but until then life is good and the happy music keeps playing. In many ways October was a reality check, but we had enough positives to start wondering if we're not as bad as the media keeps reminding us we are. Playing against solid opposition and largely on the road, we manage to win three and lose two league games over the month. The 9 points we pick up aren't enough for us to hold onto first place: we drop to second, 2 points behind Crewe. I should also mention that while we're doing well in league play, we're dropping major turds in cup competitions. We got knocked out of the EFL Cup in the first round, and now are playing in what must be the least popular tournament in England, the Checkatrade Trophy. In group play for that, we've lost two games without putting up any sort of competitive showing. Expectations are low for these matches for us, and we are going up against much better opposition at least a league above us. With that in mind, I don't really care what happens in those cups this season, and have mainly been trying to get non-starters playing time in those matches. With all the winning in our league games, though, the overall locker room mood is solid. A few players are still grumbling about playing time. I did manage to move a disgruntled defender out on loan, but I'd like to move two or three more players to get our roster down to a more functional size. I'm a bit confused, honestly, with how the transfer window thing works. The game tells me the window is closed, but I can still bid on many players. Would these sales go through in December, when the window opens again? Can I sell players now to a league where the window is open? In any case, we're off to a busy November: five league games and two cup matches. With 28 points in 14 games, we've now picked up more than half the points we need to stay up in a little less than a third of the season. Let's hope we can add a few more points to that tally this month! All of these stories is making me look forward to the new game, I'll definitely have to write up about my game once I get it! That'd be cool! I was reading up a bit on the new features, and some of them sound interesting enough that I might pick up the game sooner than later. And it's always nice to read how others are faring. Back to 1st, Steady as She Goes! In many ways November was a carbon copy of October. Once again we picked up 9 points in 5 league matches and once again got wiped out in cup play. We started out with a solid away victory against a struggling Mansfield, then fought to a tough 1-1 draw with 3rd place Leyton Place. We then bracketed a strong home victory with a pair of 1-1 draws. So 2 wins and 3 draws on the month. Fortunately for us, 1st place Crewe stumbled during the month, which allowed us pass them. We now sit two points up in first place. Cup play is another story, however. While we expected to get destroyed in our Checkatrade group play match, we certainly had hoped to fare better in our FA Cup match against a team from the Vanarama National League. But playing on the road didn't help, and we lost 2-1 to make it a perfect 5 defeats in 5 non-league competitions this season. Yikes. I'm glad the board had zero expectations for us this season in cup play, because we surely lived up to them! Looking at our team's play, we desperately need an improvement at left back. Our current pair are so bad that I've all but abandoned our more conservative 4-4-2 and almost exclusively rely now on our 3-1-4-2 DM formation. Ben Williams has been our hope at left back for the past two seasons, but his lackadaisical attitude to training has left his potential totally unfulfilled. It's time to cut bait on this one. Our backup left back, however, has been even worse than Williams, so the current plan is to get better left backs in during the January transfer window. Our scouting department has been hyper focused on left backs for the past month. And I would be remiss if I didn't share what has to be the second lamest goal that I've seen in Football Manager during AFC Telford's campaign. Fortunately, we "scored" it, if you'd call it that, while playing down a man against a struggling Newport Co. I have no idea what their keeper was thinking. The goal got us a 1-1 draw in the game. If one-point in the standings makes a difference at the end of the season, it'd be hard not to point at this goal and call us lucky. Anyway, on to December! Because we've been so quickly eliminated from cup play, our monthly schedule looks quite a bit easier now. We only have four matches this month, which will take us to the midway mark in the season. Off we go! We only manage to pick up 4 out of 12 possible points in December, in what was an aggravating stretch of missed opportunities, injuries, suspensions, and illness. 4th place Accrington bury us 5-3 to start the month. We bounce back in the next two matches, earning a decent draw on the road against the 9th place team, then winning a dramatic 2-1 home match against 5 place Gillingham. So far so good you might be thinking, and a win in our last match of the month, against 20th place Rochdale, would have given us a decently positive month. It was not to be however. We completely dominated the game, outshooting Rochdale 15-3, but we could not score. We even missed a penalty in the 75th minute. Of course, with 4 minutes left they counter on us and score. We lose 1-0. Grrr. With one win, one draw, and two losses, it's our worst month so far this season. Fortunately, the rest of the top of the Sky Bet League Two struggled with us, and we end the month in 2nd place, nestled in a clump of the top four teams, all separated by a slim two points. As December closes, so does the first half of our season. Although this month was a struggle, on a larger scale we have to be thrilled with how the season is going. Instead of battling for relegation, we are battling to be one of the top three teams and gain automatic promotion to Sky Bet League One. We’ve got 41 points so far, which is pretty close to what I thought we might get for a yearly total. At this point, however, I have to wonder if promotion would be a good thing. Because of higher salary expenses, we are essentially breaking even financially. I’d think if we get promoted we’d struggle generating enough income to support a more expensive roster, and without it, we’d be unable to compete. I’d think a bigger stadium would be an answer, but we’re still not selling out our current stadium, and well, stadiums cost money. An even bigger issue is that we just don’t have a large fan base, it would appear. So while in the short term we’re having success on the pitch, the long term picture is shaky. But still, all it would take is another couple of months like December and we fall right into the four-team playoff zone, and from there our chances for promotion are much slimmer. Promotion is far from guaranteed. Our season outlook could be quite a bit different in a couple of months. Poland - December 2018: The Winter Break is Upon Us! I'm so glad I'm not doing this in real life, because I'd be a disaster in press conferences, as I cannot pronounce the name of a single team. So, we had one of those infuriating runs where your strikers suddenly forget how to score, and I've been racking my brain to try and fix it. It's not a matter of chance creation, we're doing quite well at that and usually getting more Clear-Cut Chances than our opponents. It's that our strikers then fire the ball A.) wide or B.) at the goalkeeper's face. So there have been a bunch of frustrating draws, and some god-awful losses, and we've slid from 8th down to 13th in the table. This could be, of course, us reverting to the mean (the team did almost get relegated last year), but it's still frustrating as hell. Part of the problem is, as well, that my best Center-Back has had his head turned by Hapoel Tel Aviv. I fail to see how a move to the Israeli Premier League would be a major step up, but they're playing their best player nearly a half-million bucks, so that explains it. Anyway, the Winter Break is upon us, which, this season, runs from December 17 to February 16. I need to be in the market for a new striker, ASAP, because we shouldn't necessarily be Top 5, but we should be Top 8, or thereabouts. In case it helps, one thing that I noticed this season that I didn't notice before was how the workload of coaches' responsibilities can determine how much attention players get at certain areas of their game. So in the responsibilities section of training, I had only one coach working with the players on shooting, and at the bottom it showed that coach workload was "heavy" for that part of training. Then I started to notice that several of my players had as a negative in their profiles a comment like "doesn't feel like he's getting enough attention during shooting practice" or something like that. I adjusted my coaching responsibilities to reduce the coach workload to average and then those complaints went away. Come to think of it, I'm not sure that my scoring changed much due to fixing it, but anyway, I'm sure it can't hurt. Saw one of my favorite results in the Europa League tonight. Stoke and Stuttgart played to a 2-2 draw in the first leg of the First Knockout Round, and then, in the reverse fixture, Stuttgart went up 3-0 in 33 minutes, 5-2 on aggregate. But somehow, Stoke stormed back and drew the game a 3-3, going through on away goals. Even worse, it was a total FMing. Stuttgart had 18 shots, 10 on target, and Jack Butland played a 6.1 (Stuttgart as a whole played a 7.15 to Stoke's 6.85), while Stoke went through with just 5 shots, and only 3 on target. I cannot imagine how incensed I'd be if that happened to me. Seriously though, look how insane the First Knockout Round was. You're getting it on release, right? I'm looking forward to your impressions! I am, although I doubt there'll be a whole lot to really get excited over. For all the hype, yearly release sports games usually see refinement and incremental improvement (which is why they get so much flak, I think) and I'm okay with that. Having said that, some of the stuff about how their approaching team chemistry sounded pretty cool. I'm interested to see how that plays out. And rumor has it that they have upgraded the graphics engine as well? That'd be interesting to see. As an aside, I'm hoping to get back into Telford shortly. Work, life, and a side trip into Skyrim has kept me away for a bit. Hey! It looks like FM! This marks the first time in 18 years that I haven't bought a CM/FM on launch day. I said I would, but I just thought about it and said to myself "man, can I really be bothered with this right now?" There's so much to play. I will get it eventually, but that ends quite the streak! Reviews are decidedly mixed. Lots of crash reports, looks like. Haven't had one yet, myself, but I've literally barely started. I noticed Steam downloaded what looked like a patch last night while I was playing, I'm assuming that may have had something to do with it. Seems about par for the course with modern releases these days. I'm enjoying myself though, even though I'm currently on my 5th start (had to find the sweet spot of # leagues to run). I think this one's a keeper though! In 2007, the football clubs Moor Green and Solihull Borough decided to merge, creating a new club, Solihull Moors FC. Then, in 2017, they decided to hire a heretofore unknown American as their new manager, whose prior experience largely reads "Never got picked last during pickup games" and "Promises to never, ever call it soccer." Will this mean success? Well, stranger things have happened, right? So after a few false starts, I decided to do a new Journeyman game. I was running a much larger game prior to this one, but I noticed that if you don't speak the language and your reputation is nada, Lower League teams in other nations are disinclined to hire you. 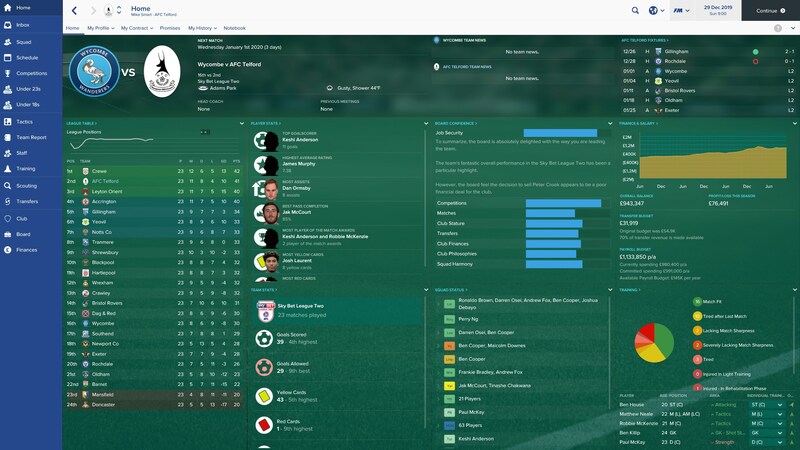 So I cut down the number of leagues I was running and started again, and again, the only approaches for a job that I got were from English teams, but to my surprise, I won't be starting at the absolute bottom of the pyramid, as Solihull Moors offered me a gig in the Vanarama National League. So that's the good news. The BAD news is that Solihull are currently expected to take a trip through the trapdoor this season, so my first gig will be a battle against relegation. An interesting change to last year's game: So, when I signed this deal, I had to promise the chairman that I would not apply to any new jobs for at least 180 days, which will mark a significant change from how I played my last game, when I was an absolute job applications whore. Also, apparently, we have a Affiliate Club deal with Birmingham City that cannot be canceled, that also prevents us from playing in the same division as Birmingham. That pretty much precludes any chance of this being a long-term single-club save, but it wasn't supposed to anyway, this is a journeyman game! Onwards and upwards! So, in real life, Solihull Moors are currently rock bottom of the Vanarama National League, and in my game, I'm seeing why. We went 0-1-3 in the preseason, featuring a 3-0 humbling by Coventry City (it could've been six). So I wasn't expecting much when the season started against expected champions Leyton Orient, and early signs showed that I had little reason to. Orient took the lead on a early header from a corner, but, as the first half went on, we began to rise to the challenge, and eventually equalized just before the half. But, then fate intervened and our best midfielder had to come off due to injury in the second half and we collapsed, surrendering the winner late on. Our second game was against Boreham Wood, however, and we managed an impressive turnaround on the road, winning 2-1. We're still expected to go down, but three points are three points. We've got another 40-odd games to go, and for us to be able to feel safe, we're going to need another 49 points. In the meantime, I desperately need some new blood in here, and they've changed scouting around this year. We have a limited ($10K) scouting budget for the entire season, and I don't have anywhere near the money to buy a scouting package to get a better idea of the players who might be interested in playing for us, so I'm relying on our scouts. It's... slow going, to say the least. We need a new DM, a new AMR, two of our three strikers are currently injured, and headed into our next game against Barrow, we have.... four fit midfielders (we play a 4-3-3). There truly is nothing like non-league football. EDIT: Oh, and for what it's worth, I feel like the match engine has seen some serious improvements, as opposed to 2017. There's actually a good variety of headed goals now, for instance, and you can't tell whether or not a shot from distance is going in off a player's boot anymore (I noticed in 17 that shots from distance headed for the net always moved at warp speed). Nice start! Keep it up, Prederick! In the meantime, I desperately need some new blood in here, and they've changed scouting around this year. We have a limited ($10K) scouting budget for the entire season, and I don't have anywhere near the money to buy a scouting package to get a better idea of the players who might be interested in playing for us, so I'm relying on our scouts. At the risk of sounding really stupid... scouting packages are something new?